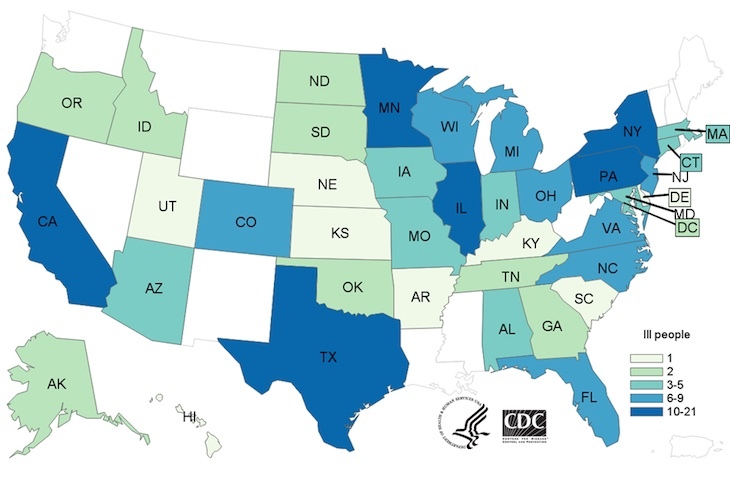 The raw turkey Salmonella Reading outbreak has been updated by the Centers for Disease Control and Prevention. The case count remains the same as it was in the last update – 216 sick in 38 states, with 84 hospitalizations and one death in California. But another product has been tied to illnesses. The case count by state is: Alabama (4), Alaska (2), Arizona (3), Arkansas (1), California (16), Colorado (6), Connecticut (3), Delaware (1), District of Columbia (2), Florida (8), Georgia (2), Hawaii (1), Idaho (2), Iowa (4), Illinois (21), Indiana (5), Kansas (1), Kentucky (1), Maryland (5), Massachusetts (3), Michigan (8), Minnesota (18), Missouri (3), Nebraska (1), New Jersey (9), New York (15), North Carolina (8), North Dakota (2), Ohio (8), Oklahoma (2), Oregon (2), Pennsylvania (10), South Carolina (1), South Dakota (2), Tennessee (2), Texas (17), Utah (1), Virginia (9), and Wisconsin (7). Raw turkey products from “a variety of sources” are contaminated with Salmonella Reading. The outbreak strain has been identified in samples taken from raw turkey pet food, raw turkey products, and live turkeys. Jenni-O Turkey Store Sales in Barron, Wisconsin recalled 91,388 pounds of raw ground turkey products on November 15, 2018. On December 21, 2018, Jennie-O Turkey Store in Faribault, Minnesota, recalled about 164,210 pounds of raw ground turkey products. And on January 28, 2019, Woody’s Pet Food Deli in Minnesota recalled Woody’s Pet Food Deli Raw Free Range Turkey that was sold in that state. Officials have not found a single, common supplier of raw turkey products or live turkeys that could account for the whole outbreak. Officials think that this pathogen could be widespread in the turkey industry. Illnesses have also been reported in Canada. There are 33 people sick with the outbreak strain of Salmonella Reading in that country. The investigation update also includes advice to consumers to avoid getting sick from raw turkey products. First, they say they do not recommend that pet owners feed their pets raw food, since this can increase the risk of someone in that household getting sick. Second, they say to handle raw turkey carefully. Always cook it to a final internal temperature of 165°F, wash your hands, utensils, and surfaces with hot soapy water after handling these products, and watch out for cross-contamination. The symptoms of Salmonella food poisoning include fever, nausea, abdominal pain, vomiting, and diarrhea that may be bloody. While most people usually recover on their own without medical attention, the long term complications of this illness can be serious, including endocarditis, arthritis, and high blood pressure. 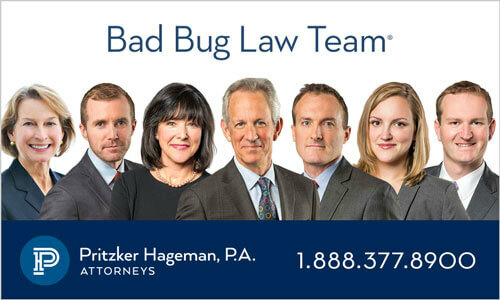 If you or a loved one have been sickened with a Salmonella Reading infection after handling raw turkey products, please contact our experienced attorneys for help at 1-888-377-8900 or 612-338-0202.